Semi-Warning: This book has some characters and references from the first two books, so it will mildly spoil you for them (including who lives/dies in some cases), but they’re not necessary background reading for this one. Full Fathom Five takes the Craft Sequence to yet another new location, this time to an island kingdom reminiscent of the Hawaiian islands. However, the series as a whole is starting to feel more like it is coming together. Instead of one or two mentions of the locations of previous books, characters from both books play a major role in this one, and events are directly referenced and discussed. Despite this, though, Gladstone has written another novel that works spectacularly well on its own, something that few series writers can manage these days. Even my favorites almost always write books that require you to read in order unless you want to miss a lot of information and have major spoilers, and it makes for a very different read. With a largely new cast of characters–including a completely new set of viewpoint characters in each novel–Gladstone has to do different work. Instead of building upon the ideas that we already have for these characters, he has to start over from ground zero, building new and interesting–and different characters, for us to watch through the eyes of. And he does a great job. Our new characters are another brilliantly varied set including a demoted priestess, a street thief who tells too many stories, a poet with some very strange inspiration, and a blind golfer. 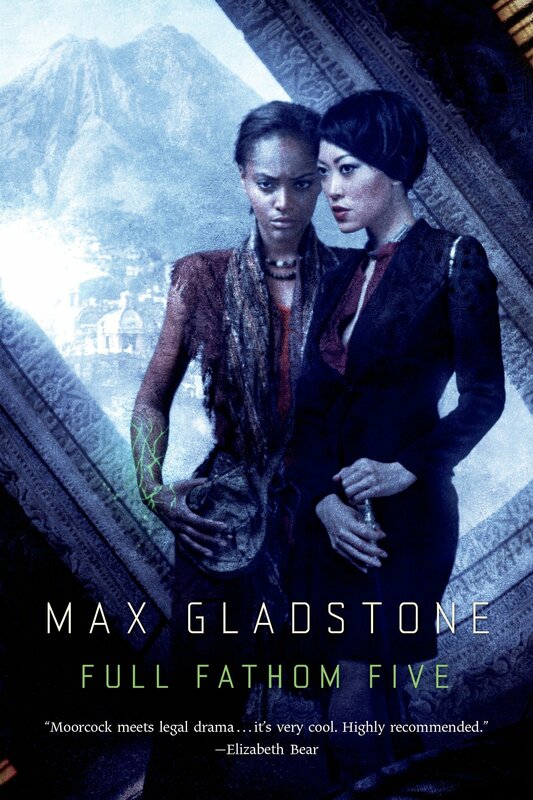 And I’m glad we had such an interesting cast of characters to meet–and Gladstone’s skill with introducing new characters every book is apparent, as I really enjoyed meeting this new set and getting to know their quirks and eccentricities. If you’re new to the Craft sequence, or even if you’re returning, you’re in for a bit of a treat with the world-building as well, as both the visual and theological aspects of the volcanic island of Kavekana are brilliantly done. I feel that, for much of the first part of the novel, it’s the worldbuilding and the new characters that really hold it up, as things do not make a lot of sense among the numerous plotlines until near the end, again, and I was confused by/bored of the plot at several places. But the plot is worth it in the end, and I consider the ending of Full Fathom Five to be on par with the first book in the series, Three Parts Dead, and more twisty and interesting than the second, Two Serpents Rise, which had a stronger plot and was more exciting, but lacked the surprise at the end. One of the ways in which this books improves in its predecessors is in the prose. There are many lines here that are incredibly quotable, and it took more self-control than I usually have to exert to not tweet another quote every few minutes while reading. Gladstone really has a way with really cool turns of phrase, and it makes other writing seem dull and utilitarian. In summary, Full Fathom Five is a generally enjoyable third novel in the Craft Sequence–or first, if you’re inclined to start there–with another brilliantly diverse set of characters, vibrant setting, and if the plot drags in the middle, it more than makes up for it by the end, which has several surprising twists and turns and wraps itself up quite nicely. The prose helps drive it along, and while it may not be my favorite of the series so far, it’s still a solid entry and I give it four out of five stars, and I’m looking forward to reading the next entry.